Facebook Audience Insights gives you a ton of data on your target demographic, which will help you laser-target your ads. And better targeting means you only pay to reach the people who are most likely to become customers. It can also help you tailor your posts to ensure you’re providing the right content, in the right voice, and at the right time to best connect with the followers you already have. You can get high-level information about your followers like age and gender. Or you can get more detailed insights like job titles, hobbies, and relationship status. You can find Facebook Audience Insights within Facebook Ads Manager. That means only business users can access Audience Insights. If you don’t have your business set up on Facebook yet, you’ll need to create your business page before you dive into these steps. Open the Audience Insights dashboard. If you have more than one ad account, choose which one you’d like insights for from the drop-down menu on the top right. Select whether you want insights about the overall Facebook audience, or only about people already connected to your page. If you have created any custom audiences for your Facebook ad campaigns, you’ll also see the option to get insights about those users. Since this guide is all about using Facebook Audience Insights to better target your ads, we’ll stick with the first option—everyone on Facebook—and look at the insights you can gain to focus your Facebook advertising strategy. Everyone on Facebook: Choose this option if you are looking for information about new potential fans and customers you could reach with your Facebook ads. People connected to your Page: Choose this option if you want to learn more about your existing audience, so you can better tailor your content to them. 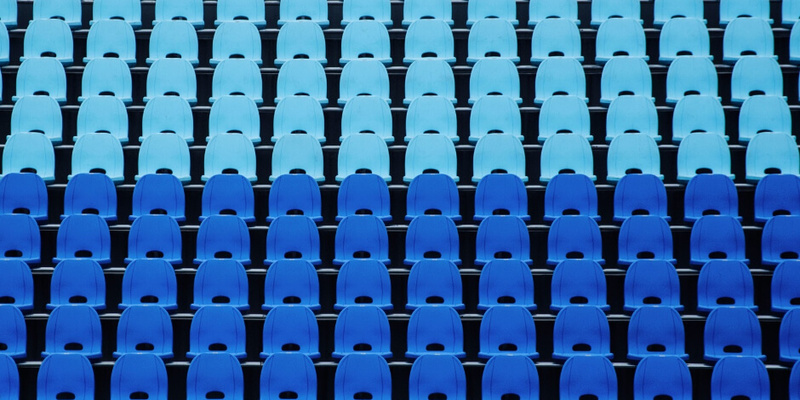 A custom audience: Choose this option if you’d like to learn more about a custom audience, like your existing customers or email subscribers, so you can uncover ways to better connect with them using Facebook. Now it’s time to start using the information available within Facebook Audience Insights to build a target market for your ads. The Audience Insights dashboard has two sections. In the left column, you select the audience characteristics to target. The right side of the page shows graphs and charts related to your audience, including how it compares to the overall audience of everyone using Facebook. Every time you make a selection to refine your audience, the graphs and percentages on the right side of the screen update automatically, so you can always see how your choices impact the audience available. The location defaults to the United States, but this may not be the appropriate option for your business. You can choose to include or exclude any country, region, or city. If you’re managing a local business with a bricks-and-mortar location, you’ll likely want to choose only your city, or your state. If you’re selling online services, you may want to include all countries worldwide. If you sell a physical product, you should stick to the countries for which shipping is available and not cost-prohibitive. Facebook Audience Insights are only available for users who are 18+, so you won’t be able to target anyone younger than that. Otherwise, you can use these options to narrow your targeting based on your existing customer research and audience personas. If you don’t know which ages or genders you want to target, go ahead and leave these as the defaults for now. You’ll get some valuable information about the gender and age makeup of your audience when you start refining your audience by interest. This is where it gets interesting. Click on the Interests box and a drop-down menu appears. Click on the items in the drop-down menu and you can refine your options even further. You should get as detailed as you can here based on information you know about your existing customers. For example, the split of all U.S. users on Facebook is 54 percent women to 46 percent men. Add “Food and drink” as an interest and that changes to 62 percent women and 38 percent men. Narrow it to “Restaurants” and it jumps to 69 percent women and 31 percent men. Narrow it further to “Coffeehouses” and the audience is 71 percent women and 29 percent men. If you’re marketing a local coffeehouse, rather than a chain, you’ll also want to narrow your audience geographically. For example, let’s say your coffeehouse is in Portland, Oregon. The percentage of genders changes again—it’s less skewed towards women. In Portland, women represent 65 percent of your coffeehouse audience, rather than 71 percent across the whole country. If you’re marketing a Portland coffeehouse on Facebook, you’ve just learned some incredibly valuable data about who your ads should be speaking to. And that’s just looking at gender. The graphs also show statistics for age, relationship status, education level, and job title. For instance, the Portland charts show that there are far more people between the ages of 25 to 34 interested in coffeehouses in Portland than there are nationwide. Under the Advanced drop-down menu, you can narrow your audience by relationship status, education level, job title and office type, and cultural group. You can choose to target parents, or even parents of a specific age of child. You can also target using life events like people who have recently moved or started a new job. For your coffeehouse business, if you choose to target only parents, the nationwide audience jumps to 77 percent women and 23 percent men. Not surprisingly, the age and relationship status graphs change dramatically as well. So, for example, if you wanted to run an ad promoting your coffeehouse as a great place for parents to bring their kids, the graphs show that you would hit more of your target audience by limiting your ad to Facebook users aged 35 and over. Once you’ve finished narrowing down your audience, click Save and give your audience a relevant name. Remember that the more detailed you get in your targeting, the smaller your audience will be. But more detailed targeting also tends to make for a more responsive list, increasing your return on investment for Facebook ads. Get as detailed as you can, but be sure to test your new audience against your existing Facebook campaigns to see how the conversion rates compare and which delivers the best ROI. Now that you’ve selected your demographics and learned some key intel about the makeup of your target audience, click over to the Page Likes tab. Here, you can learn more about what people in your selected audience already like on Facebook. 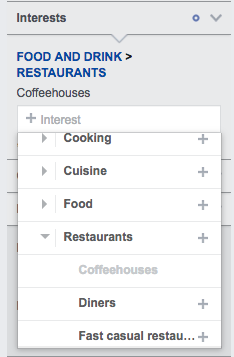 In the Top Categories section, you can learn about your audience’s general interests. Not surprisingly, coffeehouse fans are interested in the food & beverage category, as well as specialty grocery stores. Surprisingly, they are also interested in travel agencies. That indicates coffeehouse fans are also keen to travel. You can use this information to inspire ideas to test out in your organic Facebook marketing strategy, as well as your ads. For example, you could incorporate a little wanderlust imagery into your next post. Or you could run a contest where followers share their best coffee-drinking experiences from their travels. Here’s the really juicy information. In this section, you can see which existing Facebook pages are already connecting with people in your audience. Affinity: How likely your audience is to like a given Page compared to everyone on Facebook. You should click through to all of these pages to do some competitive research about what these businesses are doing, and get ideas about how you can replicate their success. But more importantly, you should make a list of these pages in a document or spreadsheet, because you’re about to pop back into the audience creation column to gain some valuable data. Under the Interests drop-down, you can type directly into the selection box. Here, enter the names of the Pages from the Page Likes tab. Not all of them will come up as interests, but for those that do, you can access demographic information about their audience. Since you get the best return on investment by targeting your ads as narrowly as possible, use the information you uncover about your competitor’s fans to further narrow your own targeting. Click Open in the top navigation bar to open your existing audience and make changes based on what you learn from your competitor research. When you have entered the additional details, click More in the top navigation. Then choose Save As to create a modified version of your audience while preserving the original. Test your newly refined audience against your original selection to see which delivers the best ROI. Keep in mind that you can’t change the audience for an active ad campaign. Now click over to the Location tab. If you’re running a bricks-and-mortar business, you already know what geographic region you want to target. But if you’re selling an online product or service, your potential geographic target is worldwide. In the Location tab, you can see where most of your potential fans live, and what languages they speak. For example, let’s say you sell Batman action figures. In the right column, clear all location selections and enter Batman action figures as an interest. You’ll see that the top market is the United States (52 percent), but you may be surprised to see that the second-largest market is Tunisia (13 percent). If you can ship to Tunisia, or you offer digital products that might appeal to a Tunisian audience, that’s an untapped market for you to explore. You can also see what languages are most common among your audience. While English is the most common language among Batman action figure fans (80 percent), 13 percent of the potential market speaks French. It may be worth creating French ads, which you can choose to show only to French-speaking Facebook users. Click on the Activity tab next to the Location tab, then scroll down to Device Users. Here, you can see which devices your selected audience uses to access Facebook, which can be helpful information for ad design. For example, among our Batman action figure fans, Android devices are hugely popular: 82 percent of this audience uses Android as their primary way of accessing Facebook. But among our Portland-based coffeehouse fans, iPhones are much more popular: 54 percent of them use an iPhone or iPod as their primary device for accessing Facebook, and only 33 percent use Android. As long as the audience you’ve built in Audience Insights is more than 1,000 people, you can use it as the target audience for an ad. Click Open in the top navigation bar, then select the audience you want to target. Then, click the green Create Ad button to place an ad targeted to this specific group. For a step-by-step walkthrough on how to actually create the ad, check out our post on how to advertise on Facebook. Ad Manager will automatically populate the targeting fields with the options you pre-selected using Audience Insights. Be sure to track the performance of each targeted ad campaign you run, and test it against your usual Facebook ROI. As you place increasingly more targeted ads, you may see the overall number of conversions drop off. But keep in mind this is because you’re showing your ad to a smaller audience. Your ROI may climb even if your conversions decrease. Testing and tracking will allow you to find the sweet spot that maximizes ROI while bringing in the number of conversions you need to meet your social media goals. Save time and manage your Facebook presence alongside your other social media channels with Hootsuite. Get to know your audience, track your performance, boost your best content, and convert fans into customers. Try it free today.